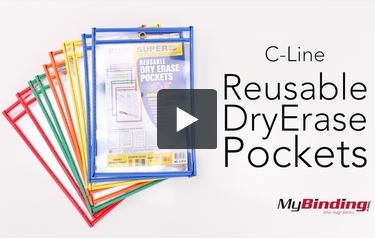 The C-Line Reusable Dry Erase Pockets help create a fun and educational method for improving students' skills. The super heavyweight material offers maximum durability with outstanding performance in preserving and protecting high-use materials. Incorporated with a convenient eyelet for hanging allows it to be safely placed in a designated spot. The pockets can be easily clean with a soft dry cloth or tissue, making it the perfect product for students to practice their math problems, writing skill or any other subjects. Assorted neon colors design to brighten your work with identifiable presentation. With the reusable dry erase pockets, you can save the environment and money by eliminating copying materials over and over again. Go green today with C-Line and let us help you protect your documents!